We’ve also witnessed the remnants of old tin being dragged out of country tips, or rescued from the destruction of rural properties to make way for new developments and thinking to ourselves “you gotta be kidding me! That ain’t ever gonna be rodded or restored!” What about something that was built locally as a daily driver doing family duties then spent time racing laps on a dirt oval track with 30 other mad maniacs getting biffed and bashed from pillar to post before being abandoned to the back of someone’s property with total disregard and forgotten about? 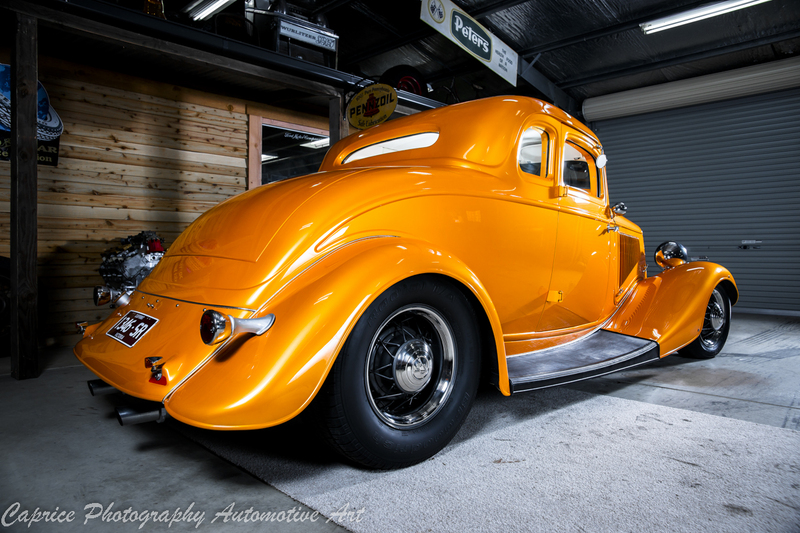 Well that’s the story of this Australian built 1933 Ford coupe! 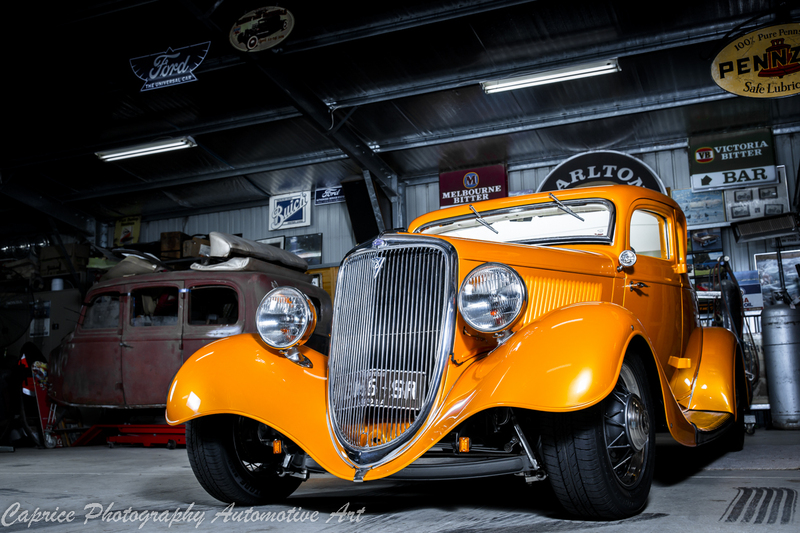 Ian Vaughan heralds from Geelong and has been in the rodding scene for most of his life, an active member of the Geelong Street Rodders, he’s always had a hankering for 34 model tin. 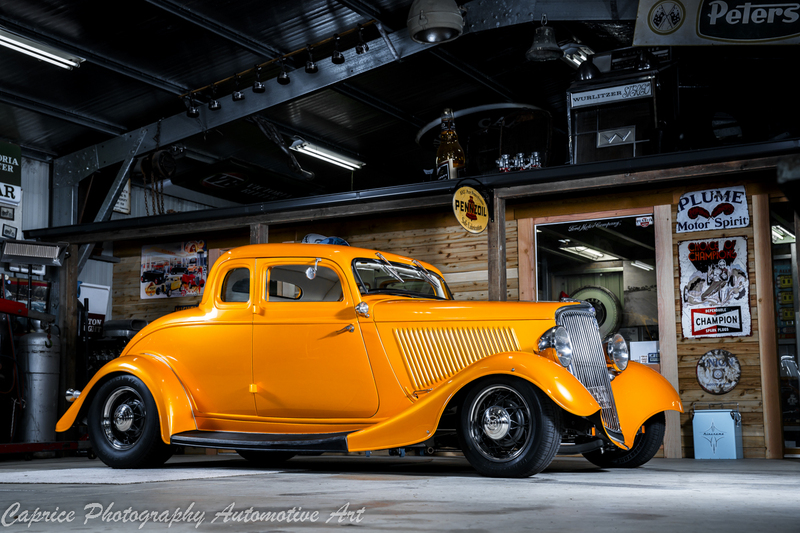 In 2001 while working on his 57 Chev, like all true car fanatics, he kept one eye on the classifieds and finally spied what he had been looking for; an Aussie built 1933 Ford coupe! Vaughany, as he’s known to his mates, headed up to Blackwood near Ballarat to check it out further. A young guy had gotten hold of the ex-race car and had dreams of building a rod of his own but never quite completed the task. Looking over what was on offer, Vaughany saw the potential and took what was left of the old girl home. 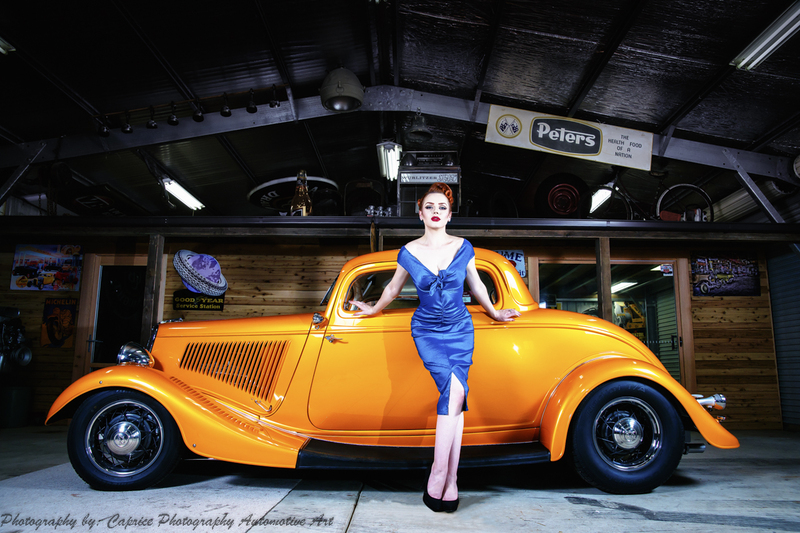 Not only home for Ian but home for the car too as she had been built at the local Ford plant in Geelong all those decades earlier. She chilled in the corner of Vaugany’s garage till 2008 where he dragged her out, dusted her off and surveyed what lay ahead. There were no guards, no bonnet, no running boards, the rear quarters had been extensively cut out to make room for wide dirt track tires, the rear pan bashed up for clearance, the roof chopped but not completed, the factory hole in the roof and basically beaten up from front to rear from racing! In Vaugany’s eyes though, with only 100 Aussie built 33s known to exist today, she was worth saving. 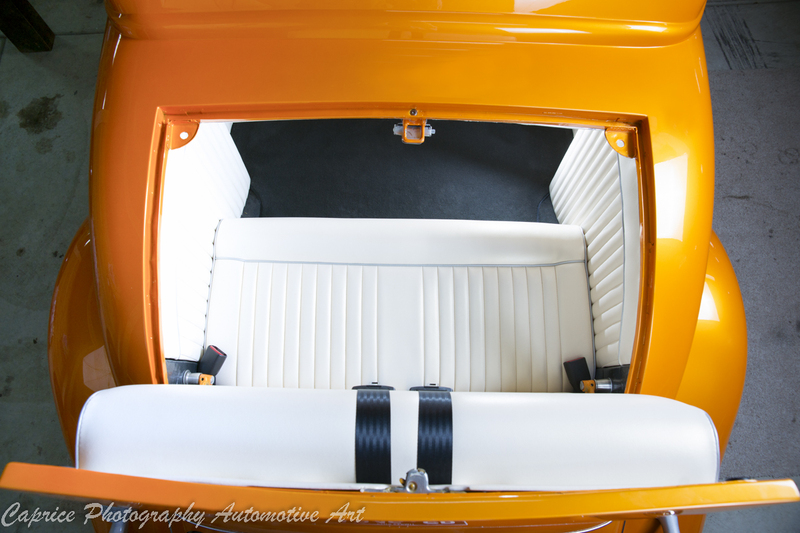 The next mission was to get the factory suicide doors to fit as they had done before wartime on the track rearranged them! This required much metal massaging, cutting, grinding and welding to have them fitting snug in their jambs. The boot lid, which at this point was nothing but a decaying skin required a complete prefabrication as did the fill panel leading up to the cab. Vaughany wanted to retain the factory dickie seat and constructed a tighter fitting unit for maximum leg room for his sons. After tidying up the 4 inch chop, the roof was filled with the roof skin off an XR Falcon station wagon which was spun around with the rear curve attaching to the front creating a perfect fit. The front guards had the spare wheel wells filled along with other sundry holes and she was starting look like a do-able rod. Ian wasn’t going waste his time over the old chassis and hunted down an aftermarket unit or more to the truth, one came his way through a fellow club member. 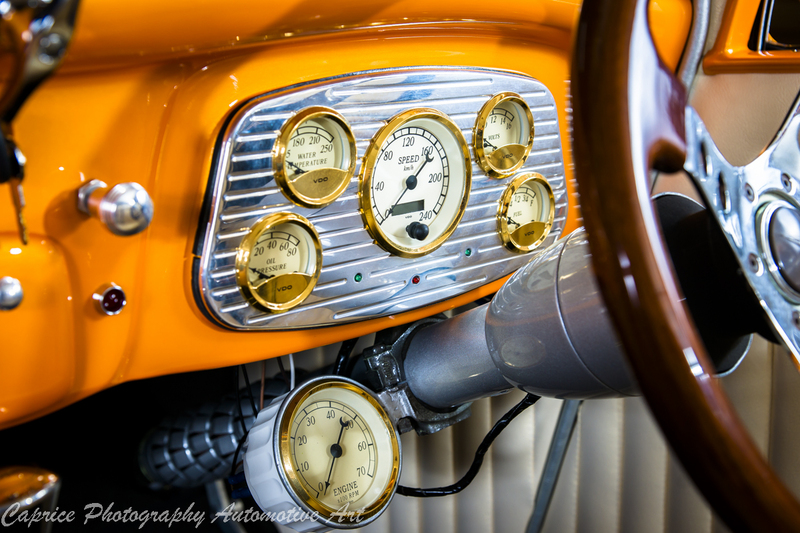 Ian tells the story “This guy was an engineering teacher and had a 34 Ford sedan. Dave and Deano went up to Sydney to buy this bloke’s sedan. The story goes, he had this sedan and had built a top of the range chassis for himself to swap with the old one in the sedan but before he could, someone pinched it and burnt it on him. He sat on the chassis for a few years but lost interest and decided to sell it so Dave bought it with the burnt body but got rid of the body.” Ian’s mate Dave was too busy to get a chance to build on the chassis so Vaughany parted with another 34 sedan he’d been working on to buy the chassis for this project. Steeling her out took two years to complete and a further three years by Vaugany’s cousin, Adrian to prep the body for paint. 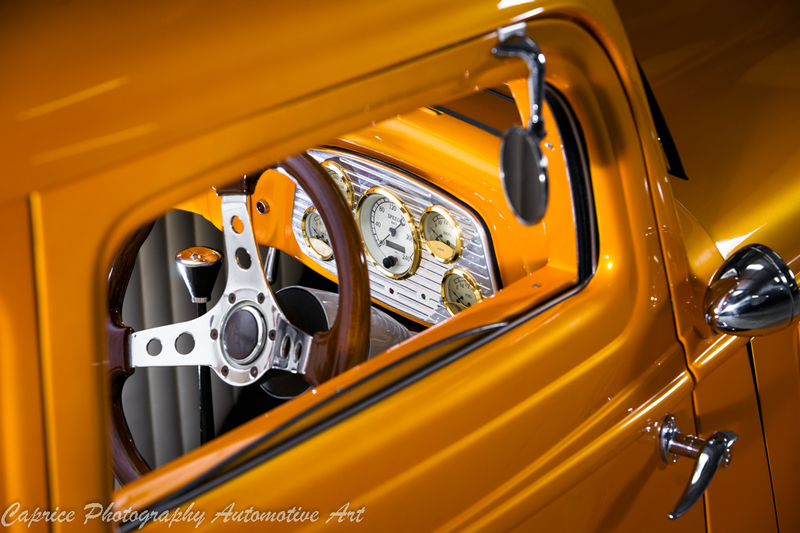 It was then coated in the eye catching orange with gold pearl you see here. The chassis copped Galaxy Grey and detailed with silver highlights for effect. The old side valve flathead had long gone so Vaughany filled the engine bay with a warmed over 350 Chev backed by a T350 through to a 9 inch running 3.55 gear ratio. 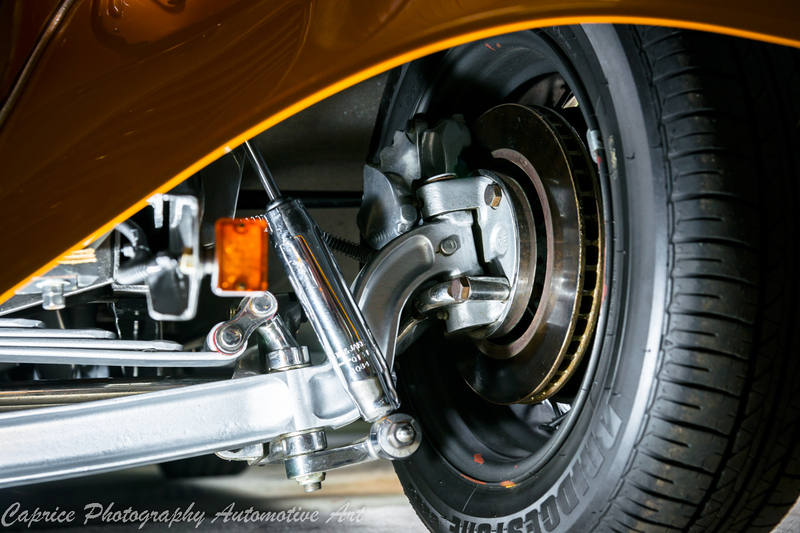 The I beam front axle still retains the original single elliptic leaf while a four link controls the rear. Disc Brakes down back are ED Falcon while HQ Holden discs are located up front. “They’re a nice compact size and go on the I beam with ease “Gemini booster and XB master cylinder complete the package. Those factory looking wheels retain the original wire centres with new wider rims attached for beefier rubber all round. 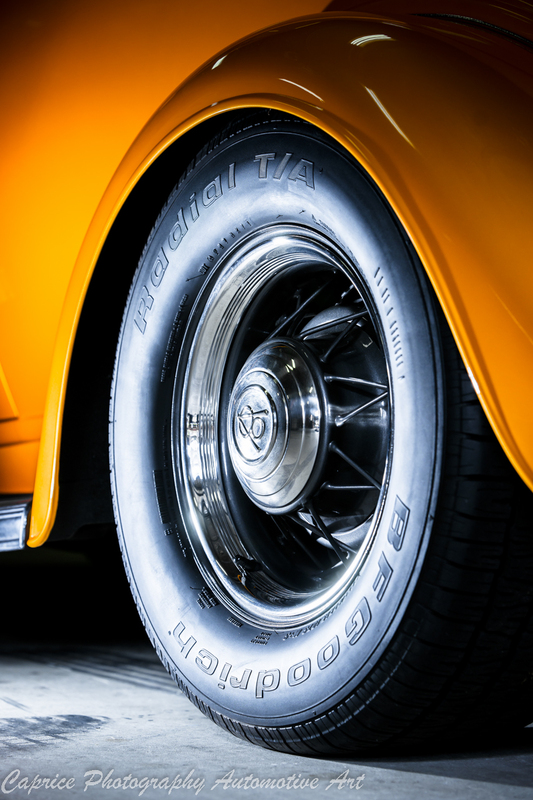 In true rodding tradition, many marques make up a rod and this all steel classic is no exception! 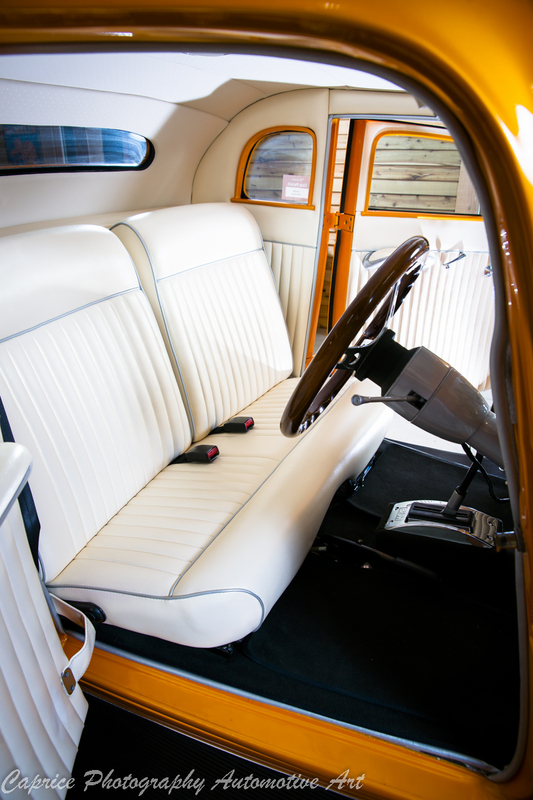 The interior consists of the original dash filled with VDO classic instruments, an XY collapsible steering column, the bench seat is an Austin base with a Valiant back while the windscreen wipers and window winders were sourced from a Morris 1800. Mark Griffin from Griff’s Trim Shop in Ballarat done the stitch work with white vinyl and sliver piping. Vaughany’s not one to rest on his laurels and is already tinkering with the fresh build, changing bits and pieces here and there but nothing that going to take her back to her sordid past. According to Ian, this is where she can call home for a long time. These projects are rarely a one man show so Vaughany would like to thank his brother, Steve and Father, Roger, Troy Newton for priming duties, Shannon at ProFinish, Adrian Fry for panel beating and paint job by Dom Stilatano. Last but not least is Ian’s wife, Paula for her patience and support while he spent three years in the garage building his pride and joy! Want to receive regular updates on future articles like this? Join the site by signing up on the blog page.